Alex started at St George's Hill at 2 years old with his lifelong friend Joe Lee. He is part of a great squash family with both his parents playing at team level and his sisters Harriet and Georgie both having held the number 1 spot in the England Junior Rankings at one age group. Alex himself was an English Under 17 number 1 who turned pro at 16 and has played the tour for the past nine years. His highest world ranking is 113 and he has featured in both PSL and Surrey Cup for St George's over the past 10 years. Tristan, whose father Tony was an international 1500 metre runner, joined St George's as a junior in 2005 and played for several years at the club, having coaching with Danny Lee before basing himself at Surrey Sports Park. 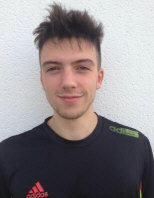 Tristan graduated from Loughborough University and then followed his dream to play on the squash circuit. He currently works with Jesse Englebrecht, the former Zimbabwe tour pro who works at Surrey Sports Park. Tristan has elected to play for South Africa and recently reached the quarter finals of their national championships. His highest World Ranking is 178. Matthew, 18, is another St George's prodigy from a squash playing family. 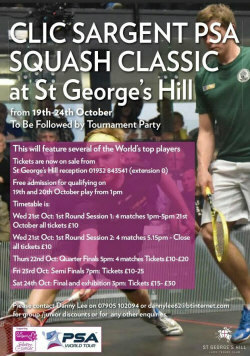 His father Robin, who has been a driving force in his development, played alongside Ross Norman, Paul Johnson, Tim Garner, Pete Genever and Danny Lee in the St George's First team for several years and his three siblings Paul, Mark and Sarah all play county junior squash. Matthew is passionate about his squash and has made his way to number 7 in the England Under 19 rankings. With his ability to fight for every point and no lack of skill he is capable of upsetting some of the better palyers in the qualifying draw. Matthew starts Nottingham University this month along with fellow Surrey juniors Ben Windle and Tom Bailey. Stuart is another young player from St George;s who has chosen to play for the country of his parents' birth. Stuart was the Irish junior champion before heading to Bristol University where he shared a house with the El Shorbagy brothers. He may tell you that he taught them everything they know about squash but we suspect its the other way around !! Stuart is back in Weybridge now training and working at St George's Hill whilst preparing for his own assault on the PSA tour . The Clic Sargent qualifying will provide him with a great opportunity to play against a higher ranked opponent and hopefully impress the home supporters.